Jewcology - | Leadership training! When I was three years old, my parents started to worry about my development. I was taking the steps and growing up like any normal child, except for one major problem: I wasn’t talking. As the youngest girl of two extroverted sisters, talking was never a necessity. All I would have to do is point, and perhaps make some noise to get attention, and my sisters would quickly understand or explain what it was that I wanted to say. My mother breathed a sigh of relief when, one day, I broke out into song, repeatedly quoting the lyrics from the “My Little Pony” movie that I had apparently memorized. Upon moving out of college and into the Jewish young professional scene, I was happily thrust into a few Jewish environmental leadership roles. While I transitioned from the Jewish community in college to the larger Jewish community in Washington, DC, I observed the diminishment of the halachik-Jewish social justice world around me. Those leaders who had very similar views and practices to my own, were suddenly far and few between, and I felt that my continued ignorance of Hillel’s philosophy was no longer a possibility. Now was the time (“If not now, then when?”) for me to use my little voice, to represent my unique standing. 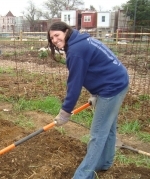 I have since sought out seminars and training workshops, to acquire more knowledge and understanding of leadership roles within the Jewish environmental and food justice movement. When I registered for the Hazon Food Conference, I noticed that Jewcology was offering a supplemental Public Narrative Training. The Jewcology description made the training seem vital for my personal growth, and I signed up anticipating that this workshop would probably be one of the more awkward experiences in my life. There was no way I would get through this one without public speaking, but that push over the edge was exactly what I was l needed. As expected, the workshop was demanding and forced me to step far away from my comfort zone. Each participant constructed a story of his/her cause, using an outline that would enable the story to have a greater impact. The outline was broken up into sections: the story of the self, the story of now, and the story of us (and if you want to learn about what any of that means, enroll in the Jewcology Public Narrative training!). Each section was to be practiced with an assigned smaller group, and prior to each team practice, I wished I could sit back and learn from the stories of the participants in my group, while avoiding participation. I felt uneasy knowing I would have to share my personal story and hopes for the future with people I had only met a few minutes earlier. After each practice, however, I realized that it would have been foolish to pass up such an invaluable opportunity to share my story and get feedback from these participants, who had transformed into coaches and symbols of encouragement. I was also surprised to find that the constructive criticism that I provided to others was accepted without opposition and seriously taken into consideration. Each person made him/herself vulnerable, while keeping an incredibly open mind on how to develop each other’s public narratives. Each story and presentation was thought-provoking and instructive. I felt empowered by my teammates and coaches, and although I was shaking in my boots when I stepped up to the front of the classroom, I was actually even impressed with my own presentation at the end of the long, intensive day. My public narrative is not complete or close to perfect, but I am so fortunate to have had the opportunity to learn these leadership skills from the people I consider to be my leaders. I am looking forward to working with them in the future, to continue on the journey of our never-ending stories, until we finally achieve our hopes and dreams of a sustainable and healthy world for all. Thanks for sharing this wonderful and meaningful blog!